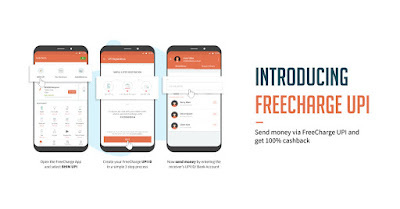 Freecharge UPI Offer – Hi Guys, We All Knows That Freecharge Has Started The BHIM UPI Integration & Now You Can Send & Receive Money With Freecharge UPI Method & Even You Can Makes The Payments Through it. Freecharge is giving free Rs.25 Cashback On UPI Money Transfer From @freecharge’ UPI handle to @freecharge handle Of Freecharge . UPI Means Unified Payments Interface (UPI). You have just follow simple steps and you will get this loot from freecharge. 2. Open and Sign up on Freecharge. The customer shall receive 5% upto Rs 25 as cashback in the form of FreeCharge Gift Instrument within 72 hours from the date of the transaction, the same can be redeemed within 1095 days from the date of the credit and is non-transferable. The offer is valid on a minimum transfer of Rs.100.